Jean-Jacques Rousseau, Emile, or On Education. 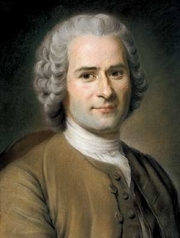 Rousseau was one of the great thinkers and influences on the Age of Enlightenment. But his work was not appreciated by the French authorities in his lifetime. After completing his Confessions in 1770, he began giving private readings of the book. But he was forced to stop this, and the work was only partially published in 1782, four years after his death. All his subsequent writings also appeared posthumously. Jean-Jacques Rousseau is currently considered a "single author." If one or more works are by a distinct, homonymous authors, go ahead and split the author. Jean-Jacques Rousseau is composed of 36 names. You can examine and separate out names.